Guilford Art Center is pleased to present the exhibition Roz Chast and Leslie Giuliani: Handmade Tales, on view in the Gallery, June 1-July 22; the opening reception is Friday, June 8, 6-8pm. This show will feature Chast’s hand-hooked rugs (Giuliani was her teacher), embroidery, prints, as well as original cartoons. Giuliani will present digitally-embroidered textile/paintings and richly-tactile encaustic works, including handmade wooden books created for the exhibition. In both artists’ work there is an urge to tell a story that can be made by, and held in, hand. Chast and Giuliani also have a relatively new shared enthusiasm—bordering on obsession—for the ukulele. 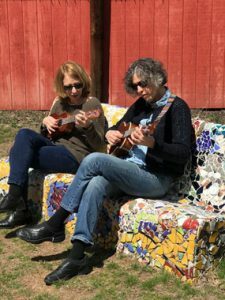 To give this side of their artistry its due, they will be playing their instruments at the opening reception, along with renowned ukulele performers and proponents, Liz and Jim Beloff. Opening reception for Handmade Tales is Friday, June 8, 6-8pm. A limited number of Roz Chast’s books will be available for sale, for signing at the event, courtesy of Breakwater Books. The reception and the exhibition are free and open to the public. Gallery hours are Monday-Saturday, 10am-4pm and Sunday 12-4pm. For more information contact www.guilfordartcenter.org or 203.453.5947. The Guilford Art Center is a non-profit school, shop and gallery established to nurture and support excellence in the arts. Through classes for adults and children, gallery programs, a shop of contemporary crafts, and special events, the Center fulfills its mission to provide opportunities for the public to participate in the arts, to experience their cultural and historical diversity, and to appreciate the process and product of creative work. Founded in 1967 (as the Guilford Handcraft Center), the Center evolved from the first Handcraft Expo, held on the Guilford Green in 1957. It currently serves over 2,000 students in classes, presents juried and invitational exhibits of art in the Center’s gallery and operates a shop of fine, handmade American crafts year-round. The Center also presents the Craft Expo, held on the Guilford Green each year in July, that features works by more than 180 of the country’s most distinguished artisans and is a much-anticipated annual event for the shoreline community.